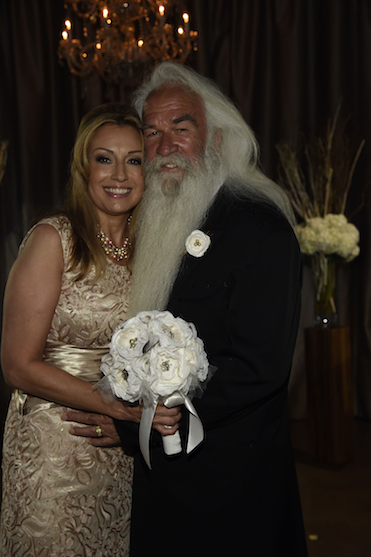 As if William Lee Golden and Simone Staley’s story couldn’t get any more romantic, it managed to when, on a warm late August 2015 Saturday afternoon, the couple consummated a decades long friendship and recent courtship with their marriage at The Rosewall event space in Nashville. 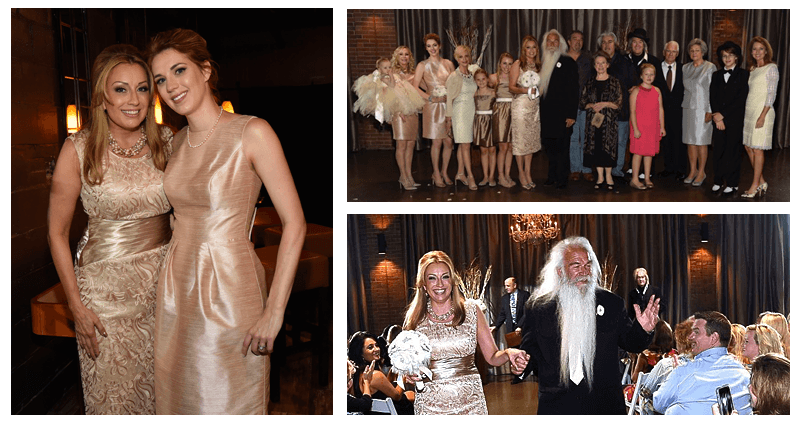 The intimate nuptials were officiated by Wayne Halper with the bride looking stunning in her custom-designed Todd Albaum and Lisa Meredith-designed dress and a pair of aptly-named "Elvira" shoes from Nina Shoes of New York. The groom was looking dapper in his custom Manuel of Nashville wardrobe. The select collection of guests included immediate family and close friends, including William Lee Golden's partners in The Oak Ridge Boys, Duane Allen, Joe Bonsall and Richard Sterban. The bride's Daughter Megan Simer and the groom's son Chris Golden both stood with their parents while Simone and William both had chairs with white roses, which symbolized the spiritual remembrance of their mothers, In them. During the ceremony, Jim Halsey, a longtime friend and the manager of The Oak Ridge Boys, offered a special moment where he presented William and Simone with an eagle feather which represents the Native American spiritual blessing of Union and the sacred Circle of love. It was a special moment which clearly touched the hearts and soul of the bride and groom and all in attendance. The couple's wedding bands, showcasing their deep love for each other, have identical inscriptions in Hebrew that reads “I am my beloved's and my beloved is mine” from the Song of Solomon. Simone's granddaughter Matilda Loren, who was carried down the aisle by her aunt Lisa, provided a bit of youthful levity and whimsy to the wedding when she seemed more content to chew on the flower petals than drop them down the aisle. Following the nuptials, family and friends gathered to celebrate in the couple’s happiness and it served as a great reminder to all involved that true love will wait out time and distance and sometimes it just needs a little luck or a couple good friends to find a way. When it is meant to be, God will make sure that true love will find a way. Always. Matt Bjorke is a Nashville-based journalist who currently serves as the editor and lead writer of the country music publication RoughStock.com.